ATN NVMP601540 6015-4 Night Vision Monocular FREE SHIPPING! 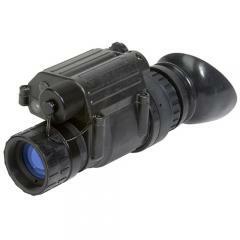 The ATN 6015-4 is a lightweight and versatile fourth-generation night vision monocular designed for professional use by military or law enforcement personnel. Based on the ATN PVS-14 used by the US Military, this monocular also meets mil-spec standards of performance. The powerful intensifier tube provides impressive resolution even in total darkness, while automatic brightness control and bright light cut-off functions guarantee a user-friendly interface. The premium optics are multi-coated to enhance light transmission and come with a protective Proshield lens coating. The system is fully waterproof and operates through a wide of temperatures, making it suitable for a variety of field and operative conditions. The device can be head or helmet-mounted for hands-free use, attached to a camera, or simply used in the hand. It includes a hands-free goggle and headgear for versatile tactical application. ©2002-2019 CopsPlus.com: ATN NVMP601540 6015-4 Night Vision Monocular FREE SHIPPING!